This is an image of Ganba no Bouken or The Adventures of Ganba. The anime debuted in the mid-1970s. Now, they’re making a CG version, and damn, it looks tragic. I quite like Ganba! So do many Japanese people. No wonder it’s one of the country’s most beloved anime. Ganba was originally based on a children’s book, but as with Kiki’s Delivery Service, the anime version is one that that has stuck in people’s minds. 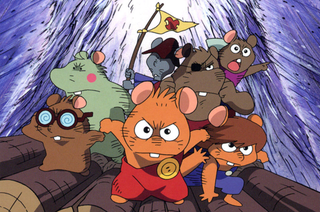 Ganba is about a rat who goes on sailing adventures with other rodent companions. The opening theme, with its New Orleans jazz style riffs, is catchy and fun. The original Ganba was so striking, so visually interesting. Forget that the designs have changed, the biggest travesty of all is that this looks bland! All of the personality and fun of Ganba look been sucked out by pedestrian computer animation and a lackluster vision. That’s a shame.